Gary Neville has revealed all about an explosive row between Sir Alex Ferguson and Peter Schmeichel that took place after United lost at Anfield when Neville was a youngster. 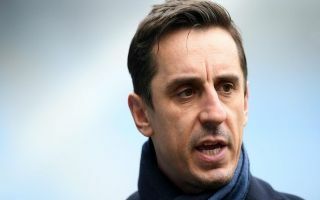 In quotes obtained by the Mirror Football, Neville was talking about his career to Jamie Carragher on Sky Sports when he revealed everything that happened in the furious row between the two United greats. “He’d be sat in the dressing room unmoved and everyone was getting showered and ready and he wouldn’t move for 25 minutes. “Once, this was when I was a kid just challenging, he had a massive row with Schmeichel in the changing room. Sir Alex was renowned for his famous ‘hairdryer treatment’, the fierce Scotsman never shied away from pulling up his players if he thought they were underperforming. Neville made 602 appearances for United during his 19-year playing career with the Old Trafford outfit. Neville recently went on a scathing rant aimed towards the Manchester United hierarchy claiming that they were “playing Football Manager with the biggest club in the world”. Neville made the point that everything has seemed to have gone downhill since Ferguson’s retirement at the end of the 2012/13 season. David Moyes took charge from his fellow Scotsman but was unsuccessful in his attempts to continue the club’s rich history of success, Louis Van Gaal was the next man to take the reigns at Old Trafford but fans didn’t like the tactics the team were using. Now United find themselves in a similar boat under Jose Mourinho. Fans and pundits have criticised United’s defensive style of play and in particular the lack of passion and desire from the team. Mourinho is facing the axe at United after the Red Devils have endured their worst start to a season in 26 years which has seen the side fall to shock defeats against Brighton, Tottenham and most recently West Ham.